May 13, 2017 will mark the five-year anniversary since the most famous moment in Premier League history. The day when Sergio Agüero scored a 94th-minute winner against Queens Park Rangers that earned City their first league title in 44 years. The manager that day was Roberto Mancini, long gone from Manchester City but never to be forgotten. 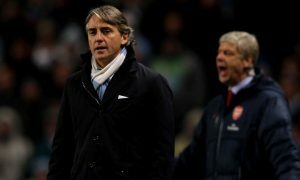 In an incredible twist of fate, Mancini could find himself back at the Etihad on May 13 this year if two things happen. The 52-year-old is currently odds on favourite to replace Claudio Ranieri at Leicester City following the sacking of Mancio’s countryman yesterday. No other candidate is currently even close in the betting odds, although he is by no means a certainty to take over at the King Power Stadium yet. Leicester are currently scheduled to visit the Etihad on May 13, a Saturday, although there is still a possibility that this game could be moved to Sunday for television purposes. But IF Mancini does take over at the reigning Premier League champions and IF City vs. Leicester stays on the Saturday, then Roberto Mancini will return to the Etihad Stadium on the fifth anniversary of his most famous moment of a manager.